Sunflowers are a happy flower. There is absolutely no way a room could look dull or lifeless with a vase of these gorgeous yellow flowers perched upon a table. They make you smile and are a perfect gift in a bouquet or a display ideal for any occasion from a birthday to an arrangement for someone who is not well. It was quite an underused flower in floristry until quite recently – you only ever really saw it at Harvest Festival time or grouped together in bunches. It is after all a very large headed flower which makes instant impact and this can lead to difficulties in harmonising or contrasting it in an arrangement. But thanks to floral designers from places such as Holland more or less anything goes in floristry these days! So long as you like it, it’s acceptable. Sunflowers are now regulars in hand-tied bouquets and larger arrangements. For a flower that has been round for thousands of years it is now looked upon as very modern. It works equally well in modern structured arrangements and traditional “just picked” look designs. So just like the ancient Incas who worshipped the sunflower as an image of their sun god, we too are beginning to appreciate the beauty and versatility of this bloom. And thanks to exports from all over the world, sunflowers are now readily available, and not just in the high street florists or wholesalers. Go into any supermarket now and you can buy bunches of them or find them singly in arrangements of other flowers. You don’t really need many sunflowers in a design to create impact. Unless you are doing a sumptuous hand-tied bouquet or large arrangements it is best to keep it simple or you could overwhelm anything you are trying to do. 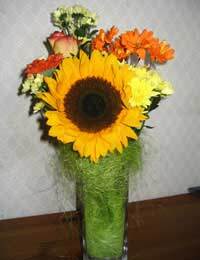 One sunflower and a few other harmonising flowers can look lovely in a simple glass vase. A simple colourful arrangement with the sunflower as a focal flower could be given as a gift, used as a table display or simply given to yourself to brighten up the day. Sunflower designs are also a fantastic talking point because they make such an impact you literally can’t avoid them – and also almost everybody smiles when they see them. One sunflower; three stems of spray chrysanthemums; one gerbera; one rose; sisal; floral foam; glass vase; frog (plastic pin holder available from any florist wholesaler which sticks to bottom of vase); florists’ putty. Use enough sisal to push into the vase and surround the floral foam. Don’t make this too structured as it is nice to have some wispy bits of sisal coming out of from the top of the vase. Start adding the flowers by placing the sunflower in the centre towards the front. Start placing the other flowers around it graduating down from behind the sunflower.